Can you feel the change in the air? The heat has broken, we have crisp evenings and every store is pulling out their Christmas decorations already (which, is a bit of a crime in my opinions since it gets earlier every year!). Since we have at least a month before Christmas is officially here, it’s time to start thinking about decorating your home to get in the festive spirit! I love decorations as much as the next person, but ornate and gorgeous decor can be expensive. Frankly, I love natural elements as much as a fancy wreath to show off my holiday spirit and that’s why I love the idea of decoration with pinecones! Nothing says winter like a pinecone and you can find them free everywhere! Check out this awesome list of perfect pinecone decorations, at your service! Glitter can make anything better, and pinecones are no exception! These gorgeous, glittered pinecones can be created in the color palette of your choice and will bring nothing but holiday cheer to your home. They work great in a bowl, covered vase or as your centerpiece. 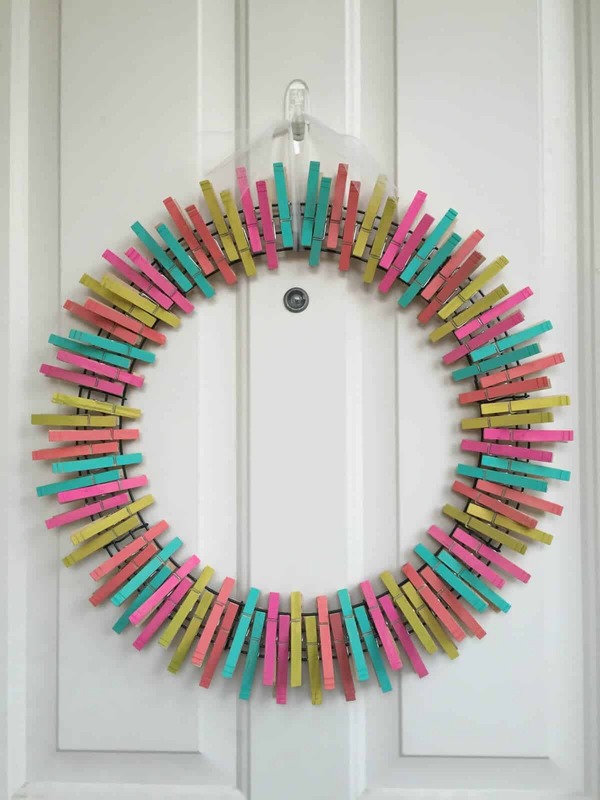 A perfect and inexpensive craft! 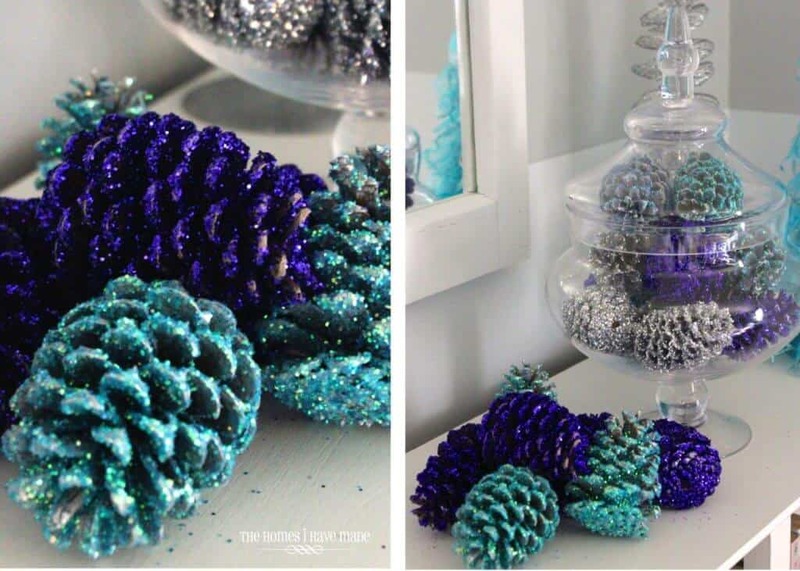 Head over to TheHomesIHaveMades.com for a full tutorial on making your own glittered pinecones! If you know me, you know I love me a good wreath and this pinecone wreath is AMAZING. The texture alone is to die for. 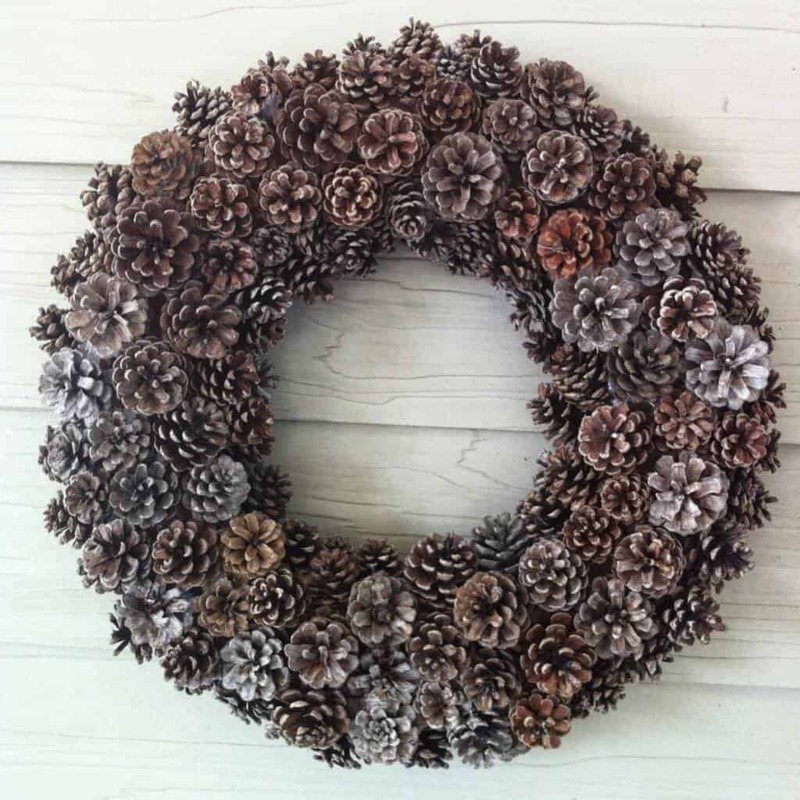 You don’t need much to make this for yourself, just a foam wreath, pinecones and lots of glue. 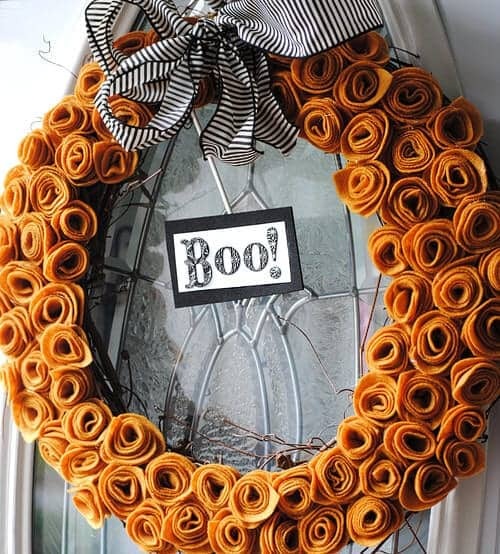 Your wreath will be the envy of the entire neighborhood! 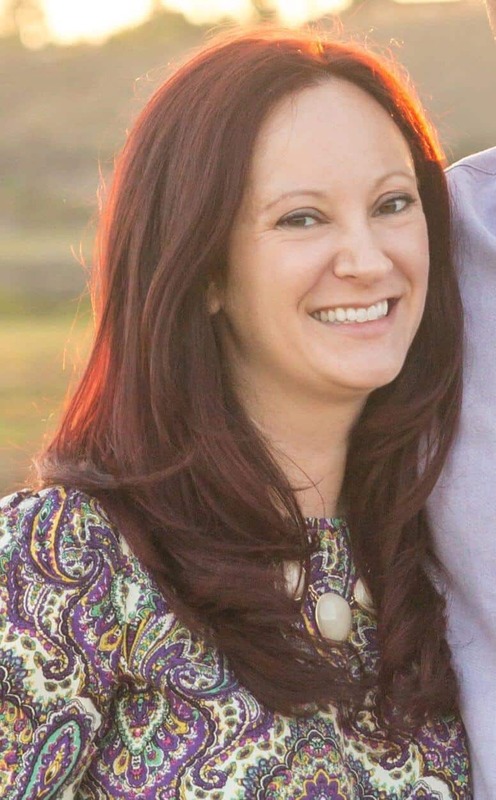 Head over to UpToDateInteriors.com for the complete tutorials, along with free printables and tons of other great design ideas for your home. A Pinecone garland is perfect for Fall and Christmas decor, because you can easily switch out the colored ribbons if you’d like. 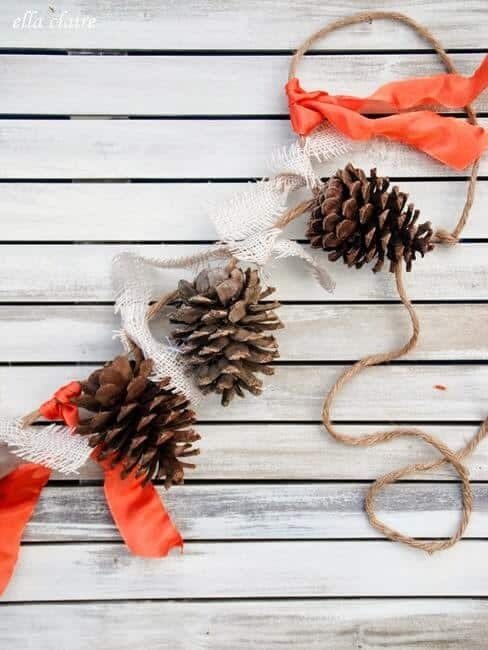 This is a simple craft that just involved tying and glueing your pinecones, along with adding the ribbon of your choice before adorning your mantle. Gorgeous! 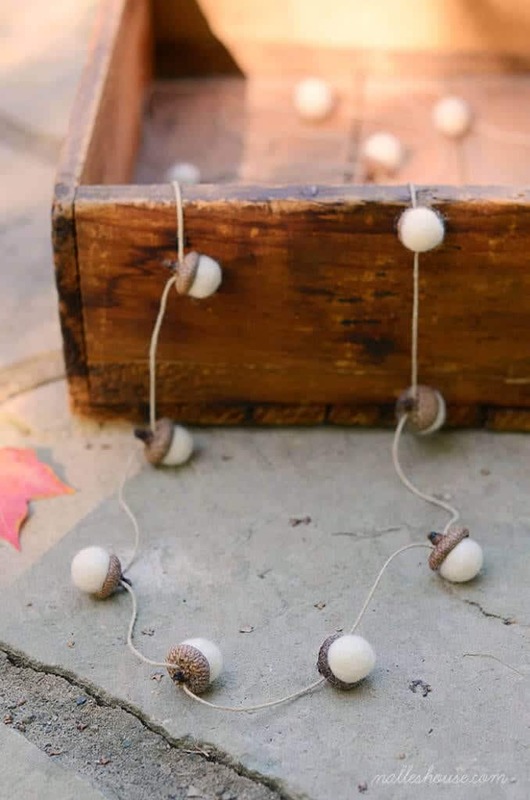 EllaClaireInspired.com has a very simple tutorial on making your own pinecone garland, along with other beautiful home decor designs. Many people have themed Christmas trees that demonstrate a color or other design, like Snowmen. I’m not one of those people, because I have too many hodge podge ornaments I’m attached to! 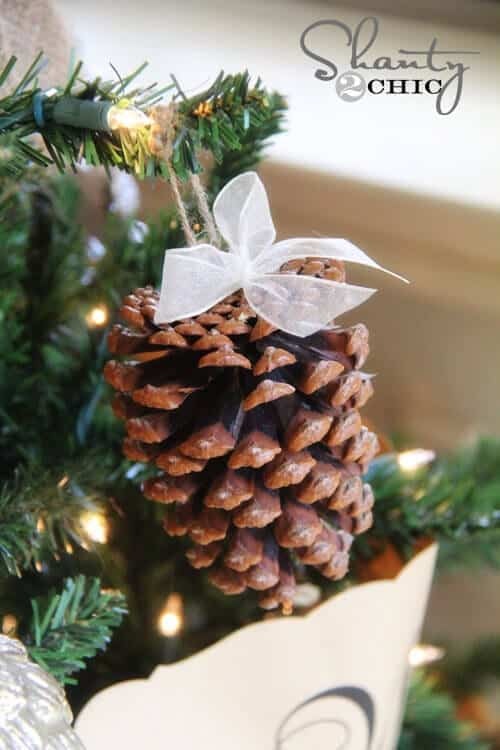 But if you love the idea of a themed, tree, you can make a pinecone-themed tree very simply! These ornaments are simple pinecones with a bead glued on the top to provide a means to thread ribbon through, then hang! Check out Shanty-2-Chic.com‘s pinecone themed tree, and get the simple steps for making your own pinecone ornaments! Maybe wreaths aren’t your thing, and you like something a little unique hanging on your door. If so, these pinecone clusters are amazing. All you are pinecones, some hot glue and ribbon. 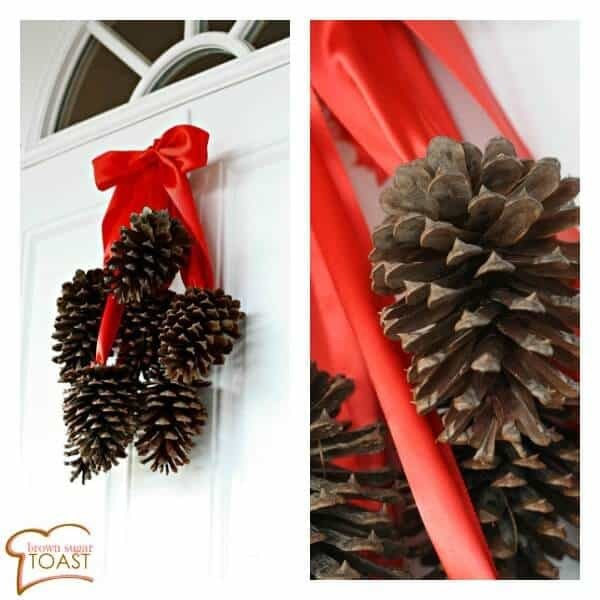 Glue the ribbon to the pinecone and hang them in various lengths. Simple and festive! BrownSugarToast.com has this super easy craft for you in addition to great recipes and amazing tutorials! In this day and age, who doesn’t love mason jars? You can make them even better by adding a simple wrap with a slice of pinecone. 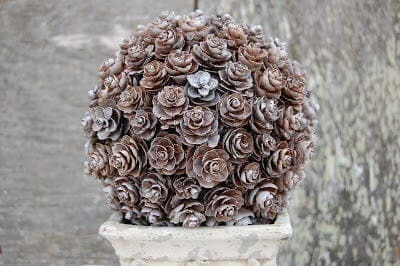 This is a great craft for fall or winter and adds some great texture to your decor. Visit UncommonDesignsOnline.com for this craft and tons more! I seriously love this festive tables cape! 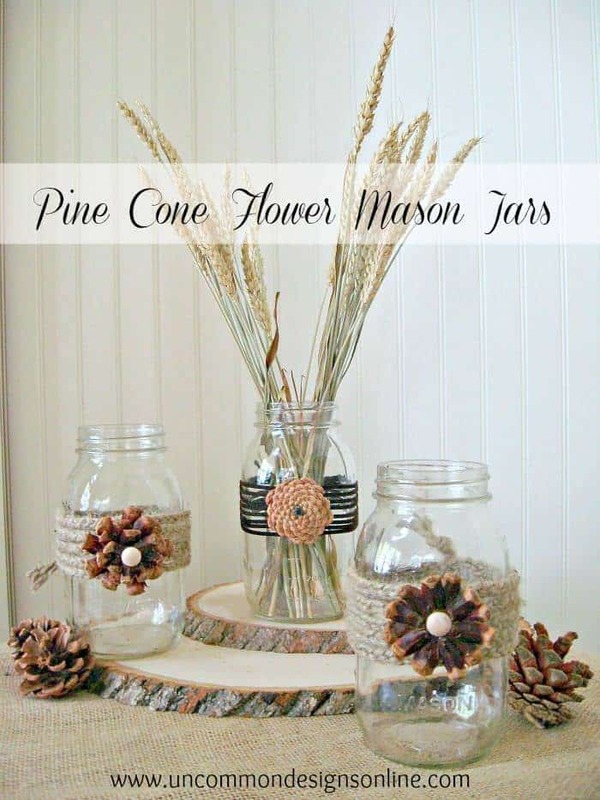 All you need are some different sized pinecones and a variety of small cups or candle holders. 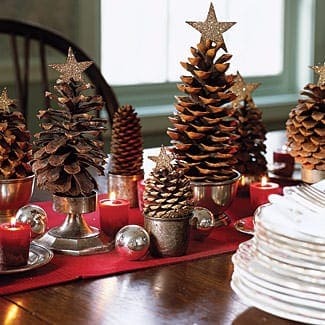 You can paint some pinecones gold or silver and place (carefully) next to candles for a wintery and warm look. You will have the best dressed table! 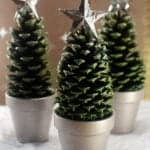 Check out GoodHousekeeping.com for this design and 5 more inspiring ways to decorate with pinecones. This topiary is perfect as a centerpiece, side table or kitchen counter decor. It’s elegant and looks very expensive! Would you believe you can make this yourself? Sure, it may take a night or two, but would you look at or gorgeous this is? 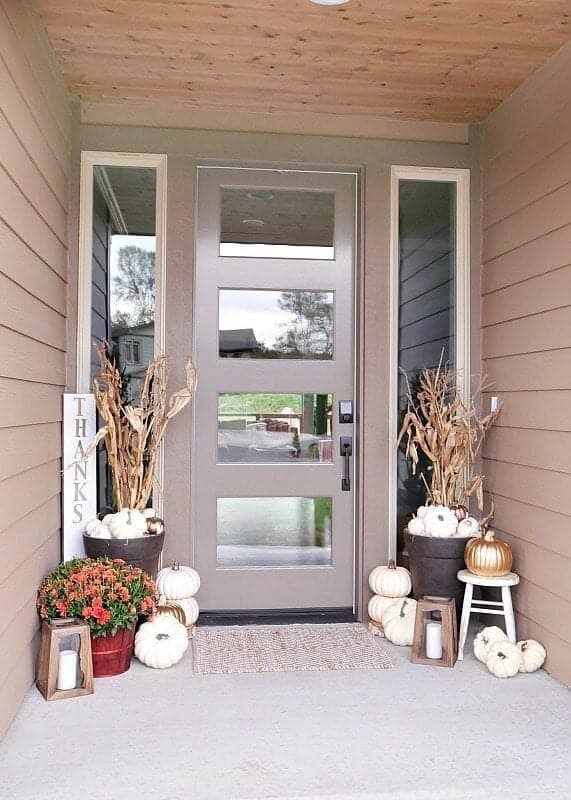 I guarantee you it will save your pocketbook, but bring quite the festive look to your home. You can even add some cute synthetic pearls here and there for a fancy feel! 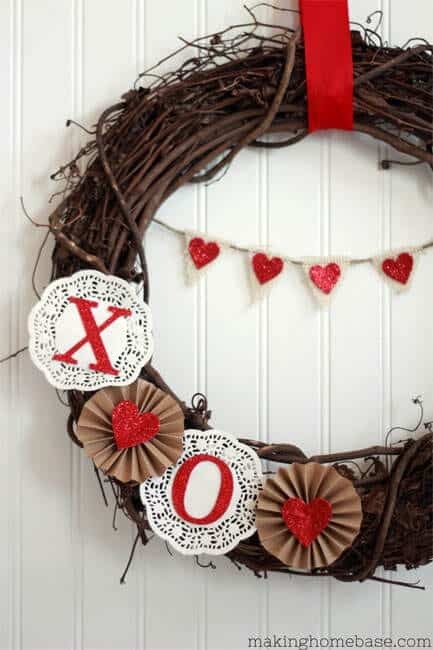 SomewhatSimple.com has this beautiful craft tutorial, as well as crafts for kids, adults, recipe and home decor ideas. 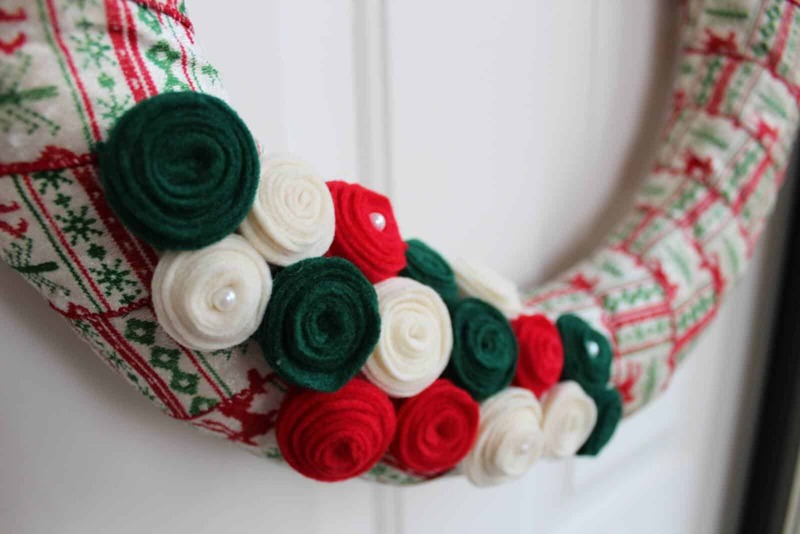 Easy DIY Fabric Holiday Wreath- ANY Mom Can Make This!